Runner in the City: Am I runner yet? So since I am in need of running shoes I called Run4it in Edinburgh and explained that I was a beginner looking for running shoes. Ben said they have a treadmill in store for gait analysis plus he sounded so lovely so off at lunchtime I went. I explained to the lovely Ben that I have sighed up to take part in a 10K in March but I don’t have any running experience or any running shoes. The Lovely Ben said no problem I am sure we will find you something suitable. So for the first time in a shoe shop I did not look at styles and colours of the shoes and wonder if I could still strike my moves on the dance floor in that height of heel, instead I was instructed by the lovely Ben that I needed to take my shoes and socks off so he could get a good look at my feet ( it was at this point I wondered if running shops suffer from men with a certain fetish applying for the job as foot analyser) Following a series of sit and down and turnaround which I was very disappointed did not end with a prize for the winner and a bowl of jelly and ice cream I was asked to go onto the treadmill on my bare feet. The treadmill. I have been on a treadmill before but I have not spent any time on a treadmill and yet here I was in the middle of a running shop at lunchtime wearing my working clothes with my trousers rolled up like a Dad taking his kids to the local beach on a bank holiday. The Lovely Ben who at this point I was starting to doubt the loveliness of, said I will start you off gently then build you up to a mild jog. To my surprise my chest did not collapse nor my heart seize. Apparently, I run quite efficiently but I have a mild (mild seemed to be word of the day) over-pronation which is slightly worse on my right foot. So shoes with a mild arch support were the order of the day. The first pair comes out and they feel nice. Back on the treadmill again and they feel comfortable. The next pair hurt the top of my foot and the third pair rubs against my ankle bone. At this point I am starting to feel that I am putting the mileage in as I am on and off the treadmill so often. It seems my training has already started in the shop. I feel sad that my coach is not there when I take my first steps. So the lovely Ben asks if they were any trainers that I fancy the look of. Now this a sign of my growth towards becoming a runner – do you know what I replied? Yes, I Geraldine, put athleticism before fashion. At this point I was glad coach DQ was not there as I think he would have cried with pride and joy at such words being uttered by me. So I went for the first pair - Asics Gel 1140 and a pair of anti-blister socks. I am going to the Lake District with my Mum for the weekend for her birthday. This will involve lots of shopping, wine, fine dining and most importantly lots of fun. I don’t see how I can fit any running into the weekend although I will try to actually go to the bar rather than just get the waiter to bring the drinks over and I will make sure I go round every boutique at least twice. At this point my coach DQ will be despairing and no doubt wondering if he has taken on too big a challenge. 90 miles of the WHW on a broken ankle will seem like a breeze compared to trying to get me to the finish line in March. Oh, how bloody true that last statement is! Dino....you gotta start somewhere, missus. And there's always room for a bit of bar related action in a balanced training programme. Looking forward to hearing how to get on. When I signed up for my first 10K in 2002 I couldn't run for a whole minute. I think I've gone full circle, as I can barely run for a minute now. 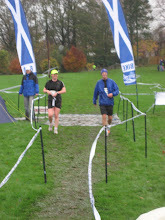 Be warned: It's a slippery slope :-) 10K today and then you get drunk and talked into something mental.